Jennifer Cognard-Black and Melissa A. Goldthwaite, Eds. It is 1796 and dinner time. What to cook for your hungry brood? Thankfully, you own American Cookery, a "treatise . . . calculated for the improvement of the rising generation of Females in America." You settle on woodcock and, following instructions, ensure the nose is dry and the throat clear before hanging the bird over open fire. It is 1896 and, of course, dinner time. Like all informed providers, your focus is the best nutrition for your growing children. In the Boston Cooking-School Cook Book, you learn eggs contain 14.9 percent "proteid," that storing in sawdust will ensure freshness, and that boiled eggs must be kept in 175-degree water, exactly. Better get to work! It is 1961 and, yet again, dinner time. In the newly published—and all-the-rage—Mastering the Art of French Cooking, you find advice on buying, slicing, and eating artichokes, as well as a recipe for Artichauts Braisés à la Provençale. Will the kids eat it? No. Will the Jones' be impressed? Very. You pour yourself a dry martini and start chopping. While kitchens and ingredients have shifted throughout America's history, our fundamental relationship with food and food writing remain surprisingly unchanged. We are concerned, to varying degrees, with taste, economy, health, and conviviality. And when in need of inspiration, we turn to words: annotated recipes, chatty cookbooks, foodie memoirs, and illuminating essays. 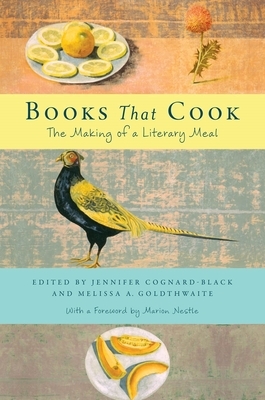 Books That Cook: The Making of a Literary Meal blends these elements of America's food and food-writing culture. Part cookbook, part history, part anthology, Books That Cook offers both literary and gustatory delight. Editors Jennifer Cognard-Black, a professor of English at St. Mary's College of Maryland, and Melissa Goldthwaite, a professor of English at Saint Joseph's University, based Books That Cook on their upper-level seminars of the same name. Cognard-Black, who is also an editor with Literary Mama, says that seminar invites students to explore the culture, symbolism, and history of food-related literature—and to cook at least one recipe to share with the class. Books That Cook is organized as a full-course meal, beginning with an invocation and starters, taking readers through various side and main dishes, and ending with dessert and a toast. Cognard-Black and Goldthwaite open each section by setting the mood. They describe the evolution of main courses, for instance, from local, seasonal fare caught or harvested pre-colonization, to the "mighty mountain of muscular beef," which often served as dinner through the 19th century, to the more cosmopolitan fare of the 20th century and the return to local, seasonal fare we now see in American kitchens and restaurants. Following such an introduction, each section presents an excerpt from a cookbook that has shaped American food and families over the past 200 years—those books mentioned above, as well as The American Frugal Housewife (1829), Joy of Cooking (1931), and Chez Panisse Menu Cookbook (1982), all of which were written by women. The meat, if you will, of each section includes fiction, essays, and poems of varying proportions and flavors. Many authors will be familiar to Literary Mama readers: Maya Angelou, Terry Tempest Williams, and Nora Ephron, for instance; and some, such as James Beard and M.F.K. Fisher, are well known among foodies and food writers. Almost all contributions to Books That Cook embrace food as relationship—to one another, to home, to history, to ourselves. Many pieces, however, are explicitly about mothers and motherhood. For instance, "In Nancy's Kitchen," by former Literary Mama Editor-in-Chief Caroline M. Grant, recalls an unsettled time of life: her firstborn was only one and the health of her mother-in-law, Nancy, was beginning to fail. That transition became anchored in food and, literally, in Nancy's kitchen. Grant writes of the ingredients she found in the cupboards (including 19 pounds of pasta), and how she and Nancy shared a love of cookbooks and cooking—despite vastly different methods of stocking and organizing a kitchen. In "Boiled Chicken Feet and Hundred-Year-Old Eggs," Shirley Geok-Lin Lim remembers her childhood in Malaysia. Though denied the crunchy chicken feet destined only for married women, she was encouraged to try pei ta-an, also known as hundred-year-old eggs (though they're only aged a month or so). In relating her eventual love for the sulfury, slimy eggs, Lim deftly broaches more weighty topics of poverty, gender, and multiculturalism. Tenaya Darlington approaches aged eggs from a completely different angle. In her story "Poison Egg," 12-year-old Janine struggles with her mother's inexplicable relocation to Hawaii and her father's subsequent coming out. She decides to poison herself with a boiled egg, which she incubates in warm places for many days. When that egg fails to sicken her, another smaller but exquisitely served egg wins Janine's heart. Although Books That Cook grew out of a university class, the chapters are diverse and rich enough to satisfy foodies, home cooks, and all lovers of beautiful writing. It is not, however, to be devoured in a single sitting. Rather, Cognard-Black and Goldthwaite offer themed menus to tailor reading by mood and taste. These include Love and Desire, How-to Poems, Family and Relationships, each consisting of a dozen or more chapters. However you choose to sample Books That Cook, take time to savor and be sure to share the bounty.